Developed with dermatologists, CeraVe Skin Renewing Retinol Day Cream with Sunscreen, SPF 30 is designed to smooth fine lines and texture. 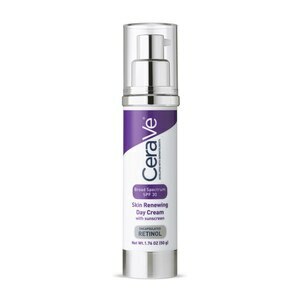 It is formulated with encapsulated retinol and is clinically shown not to irritate the skin. Encapsulated retinol stabilizes and delivers retinol gradually. CeraVe Skin Renewing Day Cream with Broad Spectrum SPF 30 Sunscreen also contains three essential ceramides (1, 3, 6-II) to help restore the protective skin barrier and it provides broad spectrum coverage protection against UVA and UVB rays. Ingredients: Octinoxate (7.5%) and Zinc Oxide (10.5%). Apply liberally 15 minutes before sun exposure. Reapply: At least every 2-hour. Use a water resistant sunscreen if swimming or sweating. Children under 6 months: Ask a doctor. Sun protection measures: Spending time in the sun increases your risk of skin cancer and early skin aging. To decrease this risk use a sunscreen with a broad spectrum SPF value of 15 or higher and other sun protection measures including: Limit time in the sun, especially from 10am to 2pm; wear long-sleeved shirts, pants, hats and sunglasses. For external use only. When using this product, avoid getting into eyes. If contact occurs, rinse thoroughly with water. If skin irritation occurs, wash product off and consult a physician.